Hoover junior Adam Griguolo caught a simple screen pass, found a lane and saw 40 yards of daylight in front of him. By the end of his run, he’d helped the Vikings put 10 years of disappointment behind them. 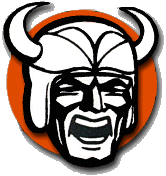 Griguolo’s 44-yard touchdown gave Hoover the lead with 75 seconds left and the Vikings’ defense did the rest, helping them hold on for a 42-35 victory on Friday night to clinch a share of their first Federal League title since 2008. Hoover (7-3, 5-1) will share the crown with McKinley. Hoover sophomore Connor Ashby — who threw the winning touchdown pass to Griguolo — had maybe his best game of a season filled with strong contenders, completing 18 of 26 passes for 385 yards, four touchdowns and an interception that deflected off the hands of one of his own receivers. Even more impressive was the fact Ashby did it conditions resembling the inside of a frog’s mouth, with a steady rain falling most of the night. Griguolo added 17 carries for 114 yards, including an 80-yard touchdown run, and also caught five passes for 116 yards and two touchdowns. He led the Vikings in both categories. “You pair those guys (Ashby and Griguolo) with our offensive line and you’ve got a nice combination,” Hoover coach Brian Baum said. “But Jackson didn’t back down. They gave us everything we could handle. The game went back and forth all night, with neither team leading by more than a touchdown at any point. The game turned on three crucial plays in the final two minutes. On a third-and-13 at their own 20, Jackson’s Trey Wright was picked off at midfield by Hoover DB A.J. Vega, who returned it to the Polar Bear 44. On the next play, Ashby tried to pass over the middle and hit a Jackson defender in the hands. Fortunately for Ashby, he dropped it. On the next play, Ashby floated the screen pass to Griguolo and he did the rest. The Polar Bears got the ball back at their own 39 with 1:13 left, but the next four plays looked like this: Wright to Noah Albright for a 2-yard loss, illegal forward pass, incompletion, holding. On fourth-and-17, Wright tried a pass deep up the right sideline, but Vega was there again for the interception. “Nerve-wracking,” Baum called the final minutes. Wright finished 10-of-18 for 158 yards, two touchdowns and two interceptions. Jake Ryan caught five of those passes for 117 yards, including a 72-yard touchdown off a flea flicker on the game’s first play. Six of the game’s 11 touchdowns came on plays of 25 yards or more, including four of Hoover’s. “I’m proud of our effort, proud of our team’s ability to fight through adversity,” said Jackson coach Tim Budd, who fell to 2-2 in the rivalry. “They just had too many explosive plays against us and it’s hard to win a game like that. It doesn’t diminish our effort, though. Noah Albright added 20 carries for 124 yards and three touchdowns for Jackson (6-4, 3-3), which was trying to make the playoffs for a school-record third year in a row. Drew Johnson added six catches for 115 yards for the Vikings, who finished just short of making the playoffs in a loaded Division II, Region 7. Their three losses came against teams with a combined 24-4 record through Friday night’s games. The same thing was true last year, when Hoover came up one yard short of tying the game in overtime. This year, it was the Vikings who made one extra play.